Azure Active Directory (Azure AD) detects suspicious actions that are related to your user accounts. For each detected action, a record called a risk event is created. 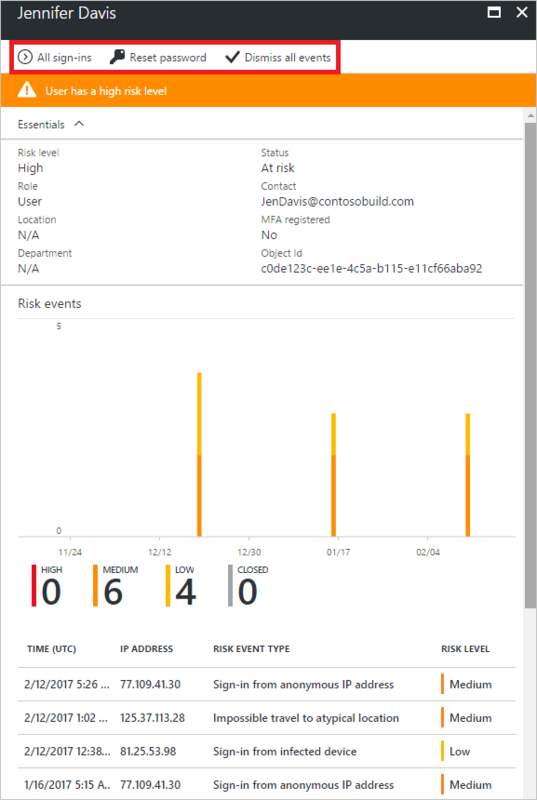 For more details, see Azure AD risk events. You can access the security reports from the Azure portal by selecting the Azure Active Directory blade and then navigating to the Security section. To learn how to configure the policies that trigger these risk events, see How to configure the user risk policy. Who can access the risky sign-ins report? To learn how to assign administrative roles to a user in Azure Active Directory, see View and assign administrator roles in Azure Active Directory. What Azure AD license do you need to access a security report? In the Azure Active Directory Free and Basic editions, you get a list of risky sign-ins. In addition, the Azure Active Directory Premium 1 edition allows you to examine some of the underlying risk events that have been detected for each report. The Azure Active Directory Premium 2 edition provides you with the most detailed information about all underlying risk events and it also enables you to configure security policies that automatically respond to configured risk levels. User - The name of the user that was used during the sign-in operation. IP - The IP address of the device that was used to connect to Azure Active Directory. Location - The location used to connect to Azure Active Directory. This is a best effort approximation based on traces, registry data, reverse look ups and other information. Aggregated information about the risk event types that have been detected. 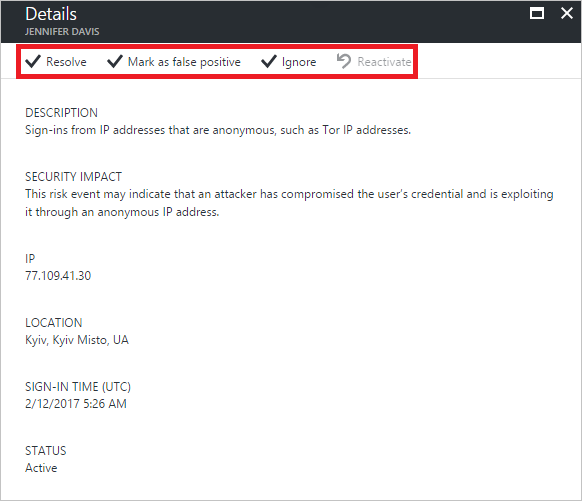 With the Azure AD Premium P1 edition, detections that are not covered by your license appear as the risk event Sign-in with additional risk detected. 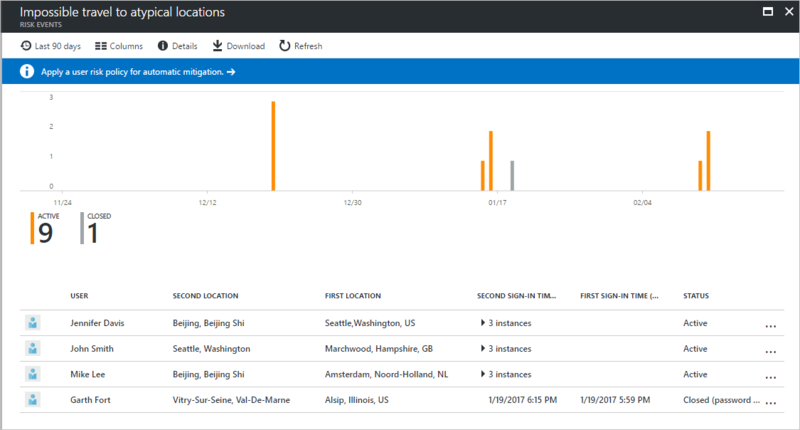 With the Azure AD Premium P2 edition, you get the most detailed information about all underlying detections. Sometimes, you may find a risk event without a corresponding sign-in entry in the sign-ins report. This is because Identity Protection evaluates risk for both interactive and non-interactive sign-ins, whereas the sign-ins report shows only the interactive sign-ins. Investigate reported risk events for the user. To investigate a risk event, select one from the list. This opens the Details blade for this risk event. On the Details blade, you have the option to either manually close a risk event or reactivate a manually closed risk event.